Minor cuts and scrapes happen from time to time. Though any open wound is a potential site for infection, we really don’t think much about the small ones other than their initial pain and the inconveniences they cause us as they heal. Most of us live in a world that is relatively safe and even minor wounds don’t happen very often. When they do, the simple steps we take to care for them plus our daily hygiene practices prevent most infections. In rare situations, when the injury becomes infected often the biggest hassle is finding the time to get to the doctor’s office for prescribed antibiotics. But in a long-term disaster/collapse situation, a minor wound–if neglected–could become deadly. In that scenario, there are several things that will aggravate the chances of getting an infection: 1) We will be doing more ‘dirty’ jobs, i.e. working outside, building fires, handling animals; 2) We will be doing a lot more manual labor, i.e. cutting wood, cooking over a fire, building and repairing, and other activities that can easily lead to cuts and scrapes; and 3) Clean water and basic hygiene will not be as accessible or convenient, i.e. no running water in the house. So a relatively minor wound that is ignored while you continue working gets more contaminated; then the wound isn’t thoroughly washed out because clean water is saved for drinking. In a short period of time that wound can develop a serious infection. What is the best way to clean and care for a minor wound? Common answers frequently include hydrogen peroxide or alcohol, but not only do both of these harm the healthy tissue they can also delay wound healing. I’ve even heard someone say that ‘alcohol must be the best because it burns the most when you apply it’ – it burns because you are killing the exposed healthy tissue. The best way to clean a minor wound, and prevent infection, is to remove all debris from the wound with cool, clean running water (this could also be poured or squirted from a container) and a mild soap. 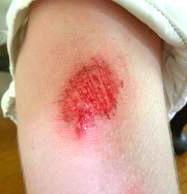 Then prior to bandaging it, lightly apply (think chapstick application) petroleum jelly on the wound. This will help the healing process by keeping the wound moist and clean and stop the bandage from sticking. Using antibiotic ointments is unnecessary, they add unneeded cost and may help create more antibiotic resistant bacteria; their main benefit is the same as the petroleum jelly. Remember there’s a fine line between tough and stupid. The only medical aid available might be from your own group. So plan ahead to minimize injury: wear protective gloves, long pants and long sleeves, and, if appropriate, a helmet and/or goggles. 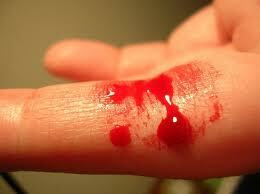 When you do get a minor wound (and you will), make it a priority to clean and dress it as soon as possible. Be sure to know where the nearest first aid kit is kept, have water available for washing, and keep soap in your preps. Even if you’ve done everything right, there’s a chance infection will occur. The type of infection common in these type wounds is cellulitis. Cellulitis, if not treated by antibiotics, “can cause a life-threatening condition known as sepsis”. This is described by Dr. Bones on his Doom and Bloom blog post, Cellulitis: An Epidemic in a Collapse. I recommend reading it. Next Monday I’ll explain what I’ve learned, and recently done myself, to acquire a stockpile of ‘collapse medicine’ antibiotics.